From Sandy: This king size New York Beauty quilt is the first paper pieced quilt I have tackled. I fell in love with New York Beauty quilt blocks and knew I had to make the quilt. From Kathy: This quilt was made for a young woman I work with. She loves technology and I was trying to come up with something unique and fun. From Karen: This denim quilt was made from scraps, after years of saving them from my five sons' jeans. No batting is used. The queen-size quilt was machine quilted by Sue at Pandora's Box in Cottage Grove, Oregon, using a meandering quilting design. From Christian: My grandmother is very modest about her sewing, she didn't even want to enter a quilt in this competition, but my mom convinced her to do it. All of the women on my mom's side of the family are great quilters, but something is clearly lost when you add in the Y chromosome -- I can't make head or tails out of their patterns. They'll have thousands of pieces laid out on the ping pong table-turned-quilting table and say "which one is out of place?" As if I would know! From peggianne: This is a king size Double Wedding Ring quilt and it is all hand pieced and hand quilted. The quilt took me eight months straight to make, working at least eight hours per day. Try a different type of Wedding Ring quilt. From Marrilee: This quilt, with 35 kaleidoscope stars, was completed in 1993. It measures 63"x48" and each star is 6.5". This is a traditional 8-pointed star, not a Stack-n-Whack quilt. I fussy-cut each diamond and used extra diamonds to made the inner border. This is the first quilt I made after taking my Learn To Quilt classes. I didn't even own a sewing machine when I started making this. From Freemanor: This Cathedral Windows quilt measures approximately 60" x 80". I made it for my niece's wedding as she has always wanted one. From Brawlassie: We are very interested in the universe. While taking a course on bargello, I saw this quilt in Quilts Without Corners, by Cheryl Phillips, and as it reminded me of galaxies I just had to make it. The quilt finishes at 50 inches diameter. From J: This quilt was made for a quilt guild challenge. The theme for the challenge was to interpret a country-western song in a quilt. I chose Ring of Fire by Johnny Cash. I love the song and enjoy machine applique, and it was fun getting all the circles to interlock. From LilyBee: My sister introduced me to quilting in 2003. I wanted something to remind me of the quilts I made the first year, and a round quilt seemed to be a good representation. Little did I know how much work a wedge quilt would be -- this one was made with an 18" Marilyn Doheny wedge ruler. The quilt is 38" in diameter. From Elaine: I saw this color scheme for a Storm at Sea quilt in a magazine and used my templates from Wendy Matheson's class to make my own quilt. The quilt was a wedding gift for a friend so I named it Smooth Sailing, as I don't wish their marriage to be stormy! Ester's Little Cat Quilt. Quilt by Rolien V.
From Quilts by Rolien: This is my first quilt, and I made it while I was pregnant. I had a lot of fun making the quilt. From Joan: This is a queen sized quilt I made for my 16-year-old granddaughter. I was inspired by Janet Wickell's article and directions for the block and wanted to do something with black and white and fabrics. From B: I made this quilt as a wedding present for a couple who enjoyed going to outdoor concerts. I collected all my well-worn jeans to make the softly framed cathedral windows. It is machine quilted with wadding between the layers to give it lots of body. It is a robust quilt, one I won't mind being used and abused outside. From Marcene: I walked into my local quilt shop and saw the Crazy Curves quilt book by Elisa Wilson and I couldn't resist making one. This is my second quilt and I'm now on my fourth -- I just can't stop quilting! From Deb: This is the last quilt that I made with my Mom before she had a stroke. It took Mom several months to convince me to even try a double wedding ring -- I have always been afraid of the curves. I think they turned out pretty stinkin' nice (as Mom would say). 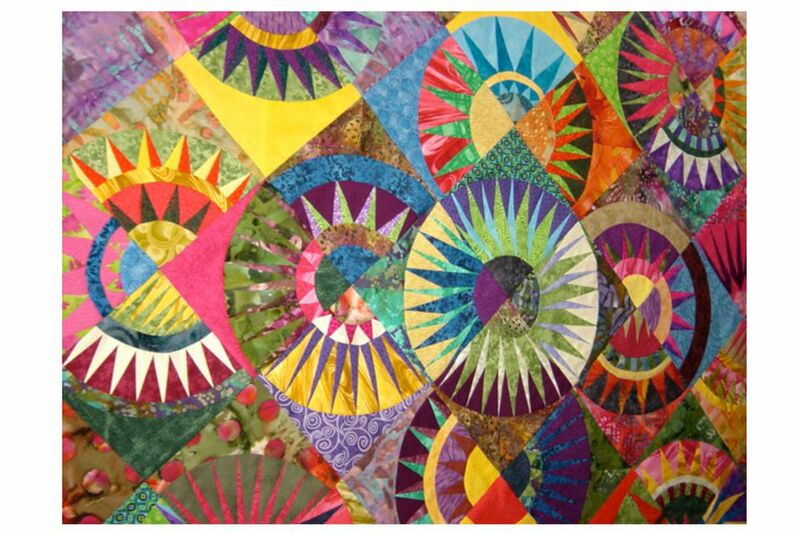 From Dee in Tex: "I wanted to try paper piecing and use some of the wonderful bright scraps I had been saving. My daughter's room had a large blue wall just begging for something bright, so this is my answer. I may not let her take it when she goes to college." From Kristen: "The fabrics for this quilt came from a 10" square fabric exchange. The theme was Surf 'N Turf, with one square being blue, one white/brown, and one a coordinating beachy theme. The Snail's Trail block seemed to be the perfect pattern to show off all the different fabrics and make them play well together." From Paegan: "I took a class from Caryl Bryer Fallert. Anyone who has seen her quilts knows they are amazing pieces of artwork. I especially loved her Soaring Compliments quilt. While making my version, I learned very useful techniques that have helped me construct other non-traditional quilts." From Paegan: "The pattern is Indian Orange Peel from Karen K. Stone's New York Beauty book. I finished this quilt in January 2006. Although not the most time-consuming quilt, it is definitely one of or the most complicated quilt I have done to date. The quilt measures 63" x 63". From K.C: My grandma worked on this quit for about ten years. Every time she had to wait anywhere she'd pull it out and work on it.